Classic phone brands from yesteryear are coming alive in Barcelona. Nokia, Blackberry and Moto were among the unlikely headline makers ahead of the Mobile World Congress trade show, which starts on Monday. Moto is owned by Lenovo, and the unit is still called Motorola Mobility. The new smartphones mixed up retro ideas with new features. A new Nokia 3310 candy-bar phone is the modern version of its classic namesake, while the new Blackberry KEYOne handset has a hard keyboard, which made previous smartphones under the brand popular. The Blackberry and Nokia brands have tremendous cachet, and fans will root for these brands to win again, said Roger Kay, principal analyst at Endpoint Technologies Associates. "The company just has to give them an excuse to buy from it once more," Kay said. A brand can be revived if the company introduces good products "and puts some cleverness and money into promoting the new products under the old and familiar name," Kay said. Nokia phones failed to gain traction under Microsoft, while BlackBerry couldn't survive competition from Apple and Samsung. Moto is doing considerably better under Lenovo, but has seen its handset market share decline thanks to other Chinese smartphone makers like Huawei, Vivo and Oppo. The KEYone handset is made by TCL, which licensed the BlackBerry brand. The handset has a Blackberry-like feel but a modern look. It has a 4.5-inch screen that can show images at a 1620x1080 pixel resolution. The Android smartphone has a Qualcomm Snapdragon 625 processor. It includes a centralized messaging system called BlackBerry Hub and a security dashboard to get a better handle on permissions requested by apps. The KEYone will ship in April for less than $549. Blackberry is big in Indonesia and also remains popular in Nigeria and South Africa, and the new handset could find some buyers in those countries, Kay said. A real blast from the past came from new Nokia phones introduced by HMD Global, which has licensed the brand name. 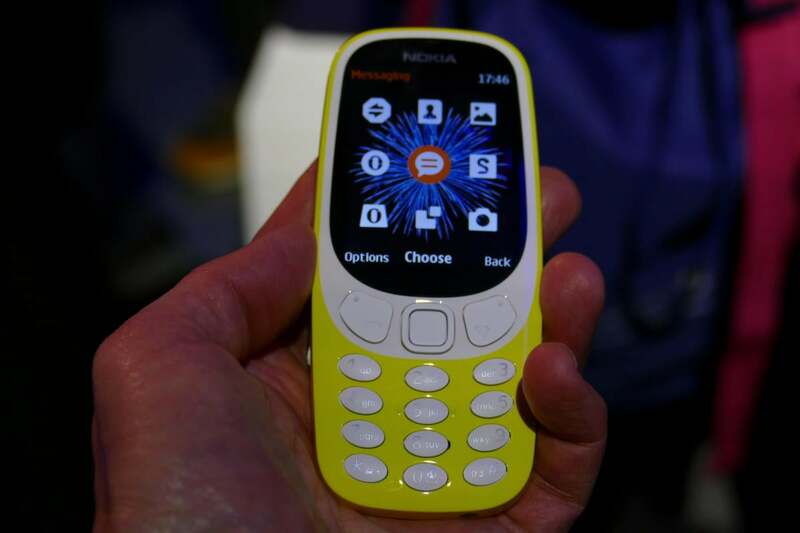 The new Nokia 3310 has a more modern look with curvy edges and is priced around $50. It's also got old-school features, including 2G connectivity for calling and text messaging -- no LTE, no 3G. It has a 2.4-inch screen, and a user interface very similar to the old phone. There's a 2-megapixel camera, 16GB of storage and and offers 22 hours of talk time. You can browse the web via an Opera Mini browser. HMD also introduced modern Nokia smartphones with Android, the Nokia 3 and Nokia 5. The Nokia 3 is a low-cost LTE phone with prices starting at roughly $146. It has a 5-inch screen, 16GB of internal storage, and 8-megapixel front and back cameras. The screen displays images at a 1280-by-720 pixel resolution. It has a quad-core MediaTek processor. The Nokia 5 will start at about $200 and is more sophisticated. Packed in the handset with a 5.2-inch 720p screen is a a 12-megapixel back camera and an 8-megapixel front camera, 16GB of storage and 2GB of RAM. It has a Snapdragon 430 processor, which is on the lower end of the Qualcomm's CPUs. Nokia phones could find acceptance in emerging markets if sold at the right price, said Annette Zimmermann, research director at Gartner. "However, I don't expect them to get big in a Western Europe -- if that should become a target market. I don't think anyone here is waiting for a Nokia phone to come back to market," Zimmermann said. Finally, Lenovo introduced the 5-inch Moto G5 and 5.2-inch Moto G5 Plus, which bring some premium features to budget handsets. The smartphones have eight-core Qualcomm CPUs, high-definition screens and high-quality cameras, which has been an issue in some older Moto G models. The Moto G5 has a 13-megapixel rear camera, while the Moto G5 Plus has a 12-megapixel rear camera with a wider focal length. Both the devices have 5-megapixel front cameras. The smartphones provide all-day battery life and charge quickly, company officials said. Overall, it's a continuation from where G4 left off, with faster processors. The Moto G5 will start at $200 and the G5 Plus at about $229. They'll be available in March across Latin America, Europe, Asia-Pacific and North America.